The dwarf Alberta spruce is diminutive evergreen with a classic pyramidal Christmas tree shape. This spruce variety is related to some giant varieties that can grow 100 feet or taller but because dwarf Alberta spruce rare exceeds about 13 feet, it is a popular choice for foundation plantings and as a specimen plant all over America. This dwarf version of the white spruce grows very slowly—growing just 2 to 4 inches per year, and it is generally grown as a large shrub or small specimen tree. The aromatic green needles are about 3/4 inch long, and the tree has a tight, densely-packed growth habit that gives dwarf Alberta spruce trees a "fuzzy" look. Unlike its larger cousins, the white spruces, dwarf Alberta spruce rarely produces pine cones. Native Area: Native from Alaska across Canada and down into Montana, Minnesota, Wisconsin, Michigan, and New York. The dwarf version, 'Conica,' was discovered at Lake Laggan, Alberta, Canada, in 1904. The Dwarf Alberta spruce tree can be grown in USDA hardiness zones 3 to 8, but it is temperamental further south than zone 6. This specimen is best suited for a climate with cold winters and cool summers. A Dwarf Alberta spruce tree grows best in full sun and well-drained acidic soil. It will tolerate some light shade but performs best in a spot with good air circulation, since its dense foliage can trap moisture. If the soil is less than ideal, amend it by working compost or another organic material into the top 15 inches of soil before planting. Planting hole should be twice as wide as the tree's container, and about 2 inches deeper. Water thoroughly after planting, and cover the ground around the tree with a thick layer of shredded bark m mulch; keep the mulch a full 3 inches away from the trunk. For the first year, water the tree weekly, saturating the soil to a depth of at least 3 inches. This tree performs best in full sun but will tolerate some shade. Grow dwarf Alberta spruce in moist, well-drained soil. It does best in soil that is slightly acid to neutral in pH. Provide these trees with water when the top 3 inches of soil becomes dry. Container specimens will need more water than those planted in the landscape. This tree requires good air circulation and does best in low-humidity environments. It performs best in areas with cold winters and cool summers. Young plants respond well to mixing in a granular fertilizer around the base of the tree once a year. Mature trees require no feeding. This tree can be propagated by 6-inch-long branch cuttings taken in late summer or early fall. Strip the needles from the lower two-thirds of the shoot, then plant them deep into sandy loam soil. Keep the soil moist until roots form, then transplant into a pots or a landscape location. Pruning is not necessary with dwarf Alberta spruce since it grows so slowly. Damaged branches should be removed whenever you find them. Pruning to shape them can be done in late winter or early spring when new growth starts to appear. Cut no more than 2 to 3 inches off the tips of the branches. Dwarf Alberta spruce trees are used as specimens in landscape design. As one of the most recognizable shrub/tree types in North American landscaping, you'll often see them used in pairs to flank the entryway to a house for a formal look that strives for balance. Because dwarf Alberta spruce trees will remain relatively small for a number of years, people sometimes treat them (at least initially) as container plants. 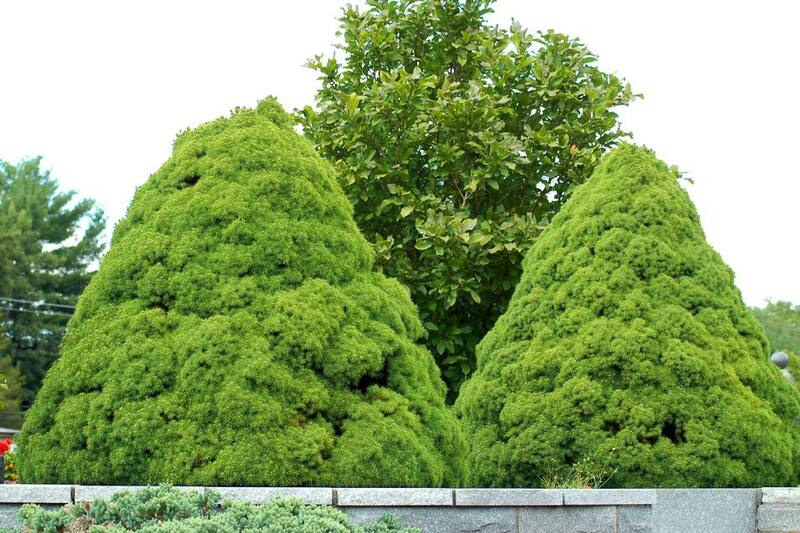 They are sometimes trimmed into topiary forms when grown in containers. However, be aware that these specimens will eventually outgrow a small space. It is best to avoid planting this tree in a spot that cannot comfortably accommodate what may eventually become a 10- to 13-foot tree. This tree is often grown in a container to use as a living Christmas tree. It can be moved outdoors in the early spring but needs to be hardened off by gradually exposing it to cooler conditions. Dwarf Alberta spruce trees are not very tolerant of air pollution and salt spray, and they struggle in areas with high heat and humidity. They require very little care but are often the victims of spider mite attacks that can kill the tree. A yearly preventative treatment with a pesticide may prevent this. Can You Grow Dwarf Alberta Spruce in a Pot in a Warm Climate?